Take a trip to Lapland and join Santa and his elves in Jingle Spin, a 5 reel, 20 payline video slot from NetEnt. As usual for a NetEnt game, the design here is superb. There’s a good range of extras available too including spreading wilds, instant wins of up to 125 times your bet as well as up to 50 free spins (initially). Play on your PC, tablet or mobile from between 20p and £200 per spin. The design in Jingle Spin has a lovely warm feel. The action takes place in Santa’s workshop. The colourful A to 10 symbols are joined by 5 higher value Christmas ornaments. The best of these is the red and gold bauble which will get you 50 times your bet if you land 5 across a payline. To the left of the reels is a Christmas tree, to the right you’ll see Santa pulling a lever to move the prize wheel. If a bauble lands in line with the pointer, it’s passed to the elf above reel 5. The bauble then moves 1 place to the left on each subsequent spin. Spreading Wild feature – the Spreading Wild bauble triggers a moving wild that replaces all symbols in its path. Free Spins feature – the Free Spin Bauble come with a number attached. If you trigger this bauble, you’ll win the attached number of free spins. This can be 7, 10, 12, 15, 25, 30 or 50. Coin Win feature – the Coin Win Bauble will show a coin amount which is awarded as an instant win prize. You can pocket up to 125 times your bet from each bauble! Surprise feature – the Surprise Bauble will give you a spreading wild, free spins trigger or a coin win. 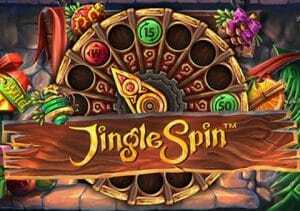 The one you want is the Free Spin Bauble as you can begin with 50 free spins – during the free spins, you can win additional free spins, get spreading wilds as well as plenty of coin win prizes. This is where the bigger wins will come from. There’s plenty to like about Jingle Spin. The visuals are superbly done and there’s a suitably magical feel to the soundtrack. The features offer plenty of variety too. The way they are triggered ratchets up the tension too. When a 50 free spin bauble is passed from elf to elf, it can get pretty tense. It’s a medium variance game with top payouts of 437.75 times your bet on each spin/free spin. We realise that Christmassy video slots aren’t for everyone. This one stays on the right side of the cheese factor on the design front and the baubles extras can deliver some big action. Get lucky there and you could be jingling all the way this festive season with Jingle Spin. If you like the gameplay but not Christmas, EggOMatic (from NetEnt) is basically the same game with a robot egg factory theme. If you want something to play all year round, NetEnt’s Vikings, which is based on the television series, is a must.